Dimensions 1.25 by 8.75 by 11.25 in. 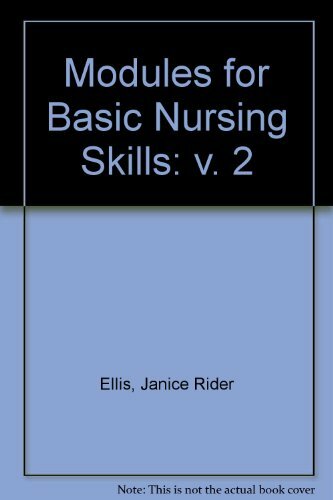 Amazon.com description: Product Description: This is the second volume of two which provide an introduction to all basic nursing skills and procedures. Focusing on how the nursing process is used in the clinical setting, this book takes a modular approach, and emphasizes rationale - to enhance understanding and reinforce learning. The new fifth edition has been thoroughly revised and updated to reflect the changes that are transforming the practice of nursing in the 1990s. It includes information on new health care patterns to show how to adapt procedures and techniques for home care and long-term care. Autologous transfusion, intermittent self-cathetarization, patient-controlled analgesia; air fluidized beds, applying braces and many more skills needed for today's complex clinical conditions are covered. The text also addresses expanding clinical responsibilities, such as nursing diagnoses, administering epidural medication and parenteral nutrition, and increased emphasis on documentation. About: This comprehensive collection of skills instruction, comprised of fifty-three self-contained modules, is now presented in a full-color, single volume. About: This is the first volume of a comprehensive two-volume skills and procedures text comprised of fifty-eight self-contained modules. About: This is the second volume of a comprehensive two-volume skills and procedures text comprised of fifty-eight self-contained modules. About: This is the first volume of two which provide an introduction to all basic nursing skills and procedures. About: This is the second volume of two which provide an introduction to all basic nursing skills and procedures.